So my sweet ricotta pies are not the only variety – there are also savory ricotta pies. I remember my great aunts making one around Easter, but I never knew how they made it. The following is for a 10-inch square or 9 x 13 (or whatever!) ceramic or glass baking dish. Mix flour, sugar and baking powder together in large bowl. Work in the margarine with your fingers. Make a well in the center. Drop in the eggs. Knead from sides to center. Let dough stand under a bowl for at least 10 minutes while making your filling. Beat ricotta and eggs (I just use a whisk). Add the rest of the ingredients and mix it all together. Do not grease the baking pan. Put your bottom and sides crust down in the pan. Then add the filling. Then the top crust, rolled out. Prick top of pie with fork. Bake at 400-degrees for 15 minutes. Then lower the temperature to 325 for another 45-55 minutes. You will know it is done when a knife comes out wet but clean and top is beautifully browned. Do NOT overcook (it will set more as it cools). When it is totally cool, cover with foil or saran and put in the fridge. It tastes better after a day or so. Serve it cold or room temperature, sliced in little rectangular wedges. Or whatever. Yes, cold or room temperature. Do NOT heat it up. Mangia! ﻿ ﻿ I spent a little time in the garden today. I did a little more spring cleaning. I also planted a red currant and some horseradish root. Yes it’s a little early, but I needed to play. Now to get on with the rest of my day. I have said (and written previously) that ever since I came to Chester County I have loved this house alone in its own meadow and field on Ship Road in Exton. So I put a photo I took up on the Chester County Ramblings Facebook page and a friend of mine told me it was a house on the National Register of Historic Places, the Benjamin Jacobs House . Anyway, the Benjamin Jacobs House has been part of the Church Farms School land parcels. It was even mentioned in the Downingtown Area Historical Society Newsletter of April 3, 2014 . 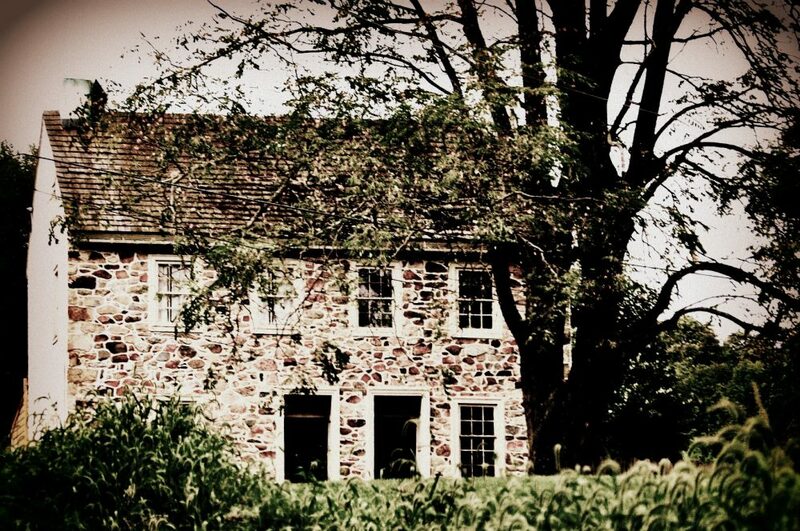 That house and the family from which it gets its name are steeped in Chester County history. So today I got a new Twitter follower request and much to my delight it is the new owner of the Benjamin Jacobs house! And the house is being restored!!! The owner, Sarah Toms, is chronicling the restoration in a blog. Personally, old house nut that I am, I am very excited about this! This is, after all something amazing in today’s age: someone actually wants to restore a truly amazing house like this! I can’t wait to read along with everyone else as the work progresses! Benjamin Jacobs House: Why Exton? I also call this cheater’s coffee cake because it is made with Bisquick a pre-made baking mix. So it is also semi-homemade but without Sandra Lee’s coordinating kitchen scape, table scape, and so on. You can also use a generic baking mix that is like Bisquick. The base for this recipe used to be on the Bisquick box. I don’t see it there anymore. But over the years I have tweaked it and this is my favorite version. It mixes up quickly and is a delicious treat on weekends! Grease with either butter or Crisco a large deep dish pie plate. In a separate bowl mix topping ingredients together with either two forks or a pastry blender until crumbly crumbs are formed. Take a large deep dish pie plate and grease it. Pour batter into pie plate. Evenly distribute crumbly topping on top and cut crisscross well across top a few times with a knife. Allow to cool for a little bit (at least 20 to 25 minutes) before serving but tastes best serve warm. I became a bit of an Italian cliché today, or a little old Italian lady in training, take your pick. I made sauce, I made gnocchi, and I made a ricotta pie. I will give you the recipe below I used a roll out store-bought crust this time –Pillsbury brand. Deep dish pie plate required. Follow instructions on premade piecrust – I like using my own pie plates so I get the Pillsberry brand piecrust when I don’t feel like making my own crust. So I laid my piecrust in my pan, fluted the edges of the crust and tossed in the freezer while I mixed up the ricotta mixture. Mix in with electric mixer 1 cup of white sugar and beat together well. Beat in 3 1/2 cups of whole milk ricotta cheese. When mixture is well mixed, you next stir in 1/3 cup candied minced orange peel and 1/3 cup candied minced lemon peel. Get out your pie shell in your deep dish pie plate and carefully pour the creamy ricotta cheese mixture into the piecrust. Bake at 350° until firm and light brown on top approximately 1 hour and 20 minutes. You can either serve this at room temperature or chilled. ﻿I couldn’t wait any longer. It was like the temptation of the Siren’s song. The garden was calling my name. Even in the not quite spring feeling rain. So I gave in and planted pansies. Well I also planted onions and another peony (just a root hasn’t budded yet). It felt good. Actually, it felt terrific.